Artist's illustration of an "isolated neutron star"--a neutron star that does not have an associated supernova remnant, binary companion or radio pulsations. Amind-bogglingly huge buildup of "vacuum energy," which would occur injust milliseconds, could lead the stellar remnants known as neutron stars toinstantly collapse or explode, scientists now suggest. Whatis often thought of as the empty vacuum of space is actually filled withghostly energy and virtual particles wavering in and out of existence, abizarre prediction of quantum theory that numerous experiments have proventrue. This"vacuumenergy," as scientists call it, is usually thought of as extremelyweak at best. But theoretical physicists in Brazil suggest that the immenselypowerful gravitationalfields of neutron stars could "awaken the vacuum," causing itsenergy to build up exponentially very quickly. Theyare extremely dense but are usually only about 12 miles (20 km) in diameter and1? to three times the mass of the sun. A sugar cube-size piece of neutron starmatter can weigh as much as a mountain ? about 100 million tons. Tolearn more about how gravity might affect empty space, theoretical physicistDaniel Vanzella of the University of S?o Paulo in S?o Carlos and his colleaguesmodeled the gravitational fields of neutron stars. Theextraordinary density of neutronstars means they possess incredibly strong gravitational pulls that warpthe fabric of space-time, distortions that could drive up vacuum energy. Surprisingly,the researchers found the vacuum energy in the neighborhood of a neutron star could?keep building exponentially, depending on the size and mass of the neutron star. Thiscould rapidly cause the vacuum energy to exceed the neutron star's combinedmass and energy. The neutron star could then either collapse to form a blackhole or explode and shed a significant fraction of its mass ? the intricatecalculations as to what exactly might occur are not yet complete, Vanzellasaid. ?Thescientists' model analyzed the effect of gravity on a so-called "scalarfield" that could represent anything from a simplified version of theelectromagnetic field to an as-yet-undiscovered particle. Onepotential criticism is that the researchers do not know of any specific fieldwith the features to cause this "vacuum awakening." Still,"95 percent of the energyof the universe is in forms which we don't know what they are ? they aregenerically called 'dark matter' and 'dark energy,'" Vanzella toldSPACE.com. "In principle, there is plenty of room for new oryet-to-be-discovered fields in nature." Ifastronomers ever do see these kinds of dramatic changes in neutron stars, thediscovery could shed light on a hitherto unknown kind of force, Vanzella said. 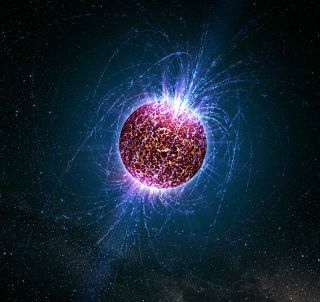 Bythe same token, if scientists detect neutron stars that are stable despite conjecturedforces, they can rule out the existence of those forces. Thescientists detailed their findings in the Oct. 7 edition of the journalPhysical Review Letters.